As Chase Briscoe climbs the racing ladder toward his ultimate goal of competing in the Monster Energy NASCAR Cup Series, the 23-year-old from Mitchell, Indiana, will grab a few rungs at Stewart-Haas Racing with Biagi-DenBeste (SHR). The championship-winning NASCAR team will field Briscoe in five NASCAR Xfinity Series races in 2018, beginning with the April 14 Fitzgerald Glider Kits 300 at Bristol (Tenn.) Motor Speedway. Briscoe will drive the No. 98 Ford Performance Ford Mustang alongside SHR teammate Cole Custer in the No. 00 Haas Automation Ford Mustang. Briscoe will return to the No. 98 Ford Performance Ford Mustang April 28 at Talladega (Ala.) Superspeedway, May 26 at Charlotte (N.C.) Motor Speedway’s 1.5-mile oval, Sept. 29 on Charlotte’s 2.28-mile, 17-turn roval, and Oct. 20 at Kansas Speedway in Kansas City. The schedule is part of Briscoe’s overall racing program in 2018. 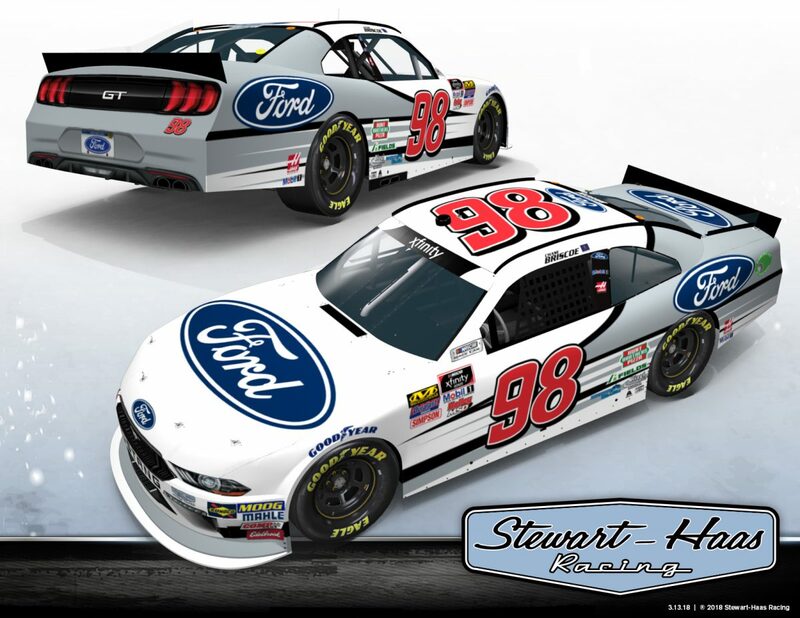 As a member of the Ford Performance Driver Development Program, Briscoe has an additional 12 Xfinity Series races with Roush Fenway Racing in 2018, which included his debut Feb. 24 at Atlanta Motor Speedway where he finished a respectable 15th. While new to SHR, Briscoe’s background makes him an excellent fit at the team co-owned by three-time NASCAR Cup Series champion Tony Stewart. Like Stewart, Briscoe’s path to NASCAR began on dirt tracks where the third-generation driver has been running sprint cars since he was 13 years old. ​Chase Briscoe’s first time behind the wheel of a racecar came in 2001. Driving a quarter midget, he won his first heat race and then won the feature event later that evening. Briscoe moved on to mini sprints and when he was 13, stepped into a 410 sprint car where in his first race he finished 10th in a 40-car field. In a rookie season that saw 37 starts, Briscoe racked up eight top-five and 17 top-10 finishes, including a win in the last race of the season, where he broke Jeff Gordon’s record as being the youngest person to win a 410 sprint car race. Briscoe continued to race 410 sprint cars in Indiana and other surrounding states. People began to take notice, and soon the switch from sprint cars to stock cars was on. Cunningham Motorsports hired Briscoe in 2016 to pilot its No. 77 Ford Fusion for a full-time drive in ARCA. Briscoe responded by winning six races and the championship. Briscoe is working on more than just ovals. As part of his road-racing development, he has teamed with veteran sports car driver Scott Maxwell, who won the 2016 IMSA Continental Tire SportsCar Challenge Series championship in a Ford Shelby GT350R-C.